When you are deciding which roof to go with when there needs to be a replacement and your current roof has gotten too old, there are plenty of options to consider. For Arizona, no roof is a particularly bad roof, but there are roofs that can be considerably more beneficial to you and your home both financially and structurally. Some roofs can be expensive to install and expensive to maintain, so why not choose a roof that is neither? The spray foam roof is one of the most underestimated outlets for roofing for completely unknown reasons. In Arizona, the most harmful thing to your roof is the sun. We don’t get much other weather, but when the sun is out, your roof can take on extensive casualties and it can be extremely expensive to repair. With the sun beating down on your roof, it is a mystery as to how it has not caught fire from the sheer heat of the long, Arizona days. But you want your roof to take the damage rather than the rest of your home. Afterall, that’s what it’s for. So when your roof is not installed properly or isn’t replaced when it needs to be, this can sometimes lead to more repairs on your house that you shouldn’t have to make. Your roof should be protecting your home, not leading to more damage. 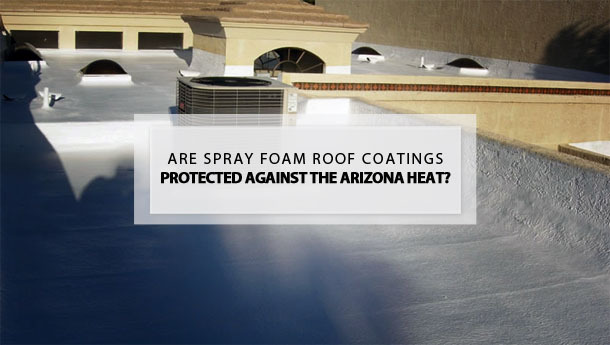 For this reason, foam roofing is beneficial to both you and your home. It can act as a sealant against what little rain we get, and also a barrier from the harsh sun. With normal roof coatings, the heat of the sun would be absorbed, most likely making the inside of your house far hotter than you would probably like it to be. The foam roof coating would make your home much cooler, as it would reflect the sun’s heat to keep it from turning your house into an oven. This, combined with comparable foam installation will save you tons on your energy bill throughout the year. Aside from temperature, the foam coating can act as a barrier against the sun’s rays. Heat damage doesn’t just make things warmer than they should be, but they also can be physically damaging and it can lead to costly repairs that will drain your wallet and turn your home into a construction zone. The blockade the foam coating creates acts as a buffer to keep this heat damage from causing extensive repairs to be made on your house. Because your roof should be your home’s first line of defense, and if it isn’t in the best shape possible, you could end up paying the ultimate price. Foam spray coatings can easily be one of the best decisions you make when you are getting your roof repaired. Sometimes, the shingles and tile roofs can become cracked and damaged, but with your foam spray coating, they will be better protected against the elements of nature. Don’t let the unpredictable weather scare you. Make sure your roof is guarded from these elements and when your roof is safe, that means the rest of your home will be safe. Before your foam roof coating is installed, you will need an extensive inspection of your existing roof. This will insure that repairs that need to be made can be brought to your attention. The last thing you want is for your foam roof coating to be installed over existing roofing that is desolate and impaired. Foam coatings can be helpful to your home and they will ultimately extend the life of your roof by almost twenty years. They are easy to maintain and inspect, and they will help protect your roof for a long time to come. With an extra easy installation, foam roof coatings will save you tons of money on all of your future energy bills. So come to First Class Foam Roof and Coating. Our experienced professional foam roofers in Cave Creek will make sure that you have the very best roofing in the Valley. With top rated services, we can insure the proper installation and maintenance of your foam roof coating. Backed by the Better Business Bureau, you know you will be getting the best quality foaming services from us, and that’s our guarantee. 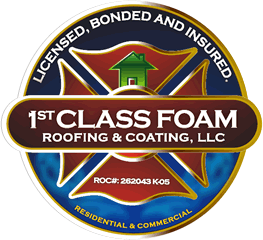 Trust the experts at First Class Foam Roof and Coating to get your foam coating done with a free consultation. Contact us today for more information at (602)-722-0663.